THE LEADER OF the British National Party Nick Griffin has been declared bankrupt, but he has insisted that it is a ‘good day’. The UK’s Insolvency Register today published details of the case which was filed yesterday and will expire one year from now. Griffin, the chairman of the controversial right-wing nationalist party and an MEP, tweeted a number of responses to the bankruptcy, saying it will not stop his involvement in politics. In a statement issued this morning, the BNP say that the primary creditor to whom Griffin owed money was a former solicitor. They say that Griffin had made an offer to pay a portion of the debt as part of an Individual Voluntary Arrangement but that this was been rejected by the creditor and as a result the bankruptcy order was made. Email “'No surrender! ': BNP leader Nick Griffin's response to being declared bankrupt”. Feedback on “'No surrender! 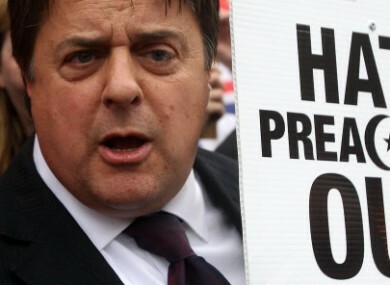 ': BNP leader Nick Griffin's response to being declared bankrupt”.